Date of publication: November 28 2013 . Charity - lots, which falls not only to the wealthy and held, but those who remain indifferent to what is happening around them. Every year for the IKEA is famous for being a Swedish company holds charity share. This time with the joint efforts of UNICEF world-renowned manufacturer of furniture and accessories "to help those who want to learn." The campaign has already started. It will last until January 5 2014 years. In order to make the children from poor countries a little happier, just buy a stuffed toy or a children's book. Equivalent 1 euros, which is nearly 40 Russian rubles, with each such purchase will be donated to Children's Fund to support educational programs in underdeveloped countries. Designers and developers IKEA thoroughly prepared for this large-scale stockSignificantly expanded its line of products. Shelves filled with soft new residents from different fairy tales. His young buyers IKEA provides an opportunity to play with them and even play a show in the walls of the store. This international event is systematic and last year noted 10-year anniversary. The participants of the country where there are IKEA stores. Thus, in 2012, Russia won the first place of honor on the number of goods sold for the period of the campaign. 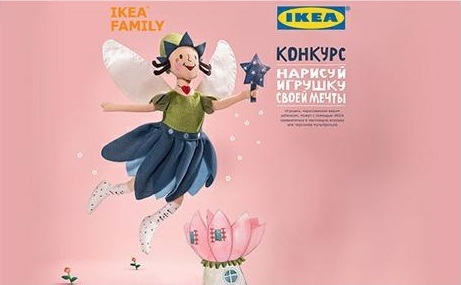 According to Walter Kadnara, director of the Russian retail IKEA, with 2003, the company donated about 57 million euros to various charities. To attract more protesters IKEA carries within it a side event. During the campaign starts competition "Draw the toy of your dreams!". He has little control and it will be open to children whose parents entered the club IKEA FAMILY. Participants are encouraged to depict their favorite hero, send their work to the website http://dom.ikea.ru/igrushkaWhere he held a popular vote. According to the results declared the winner, who will become the owner of this toy, specially made by IKEA of his drawings. IKEA invites you to take part in the action and waiting in their stores!